This image shows a teaser poster for the film "Svaha," set for release on Feb. 20, 2019. A rare mystery thriller built around the story of an imaginary covert Buddhist cult will hit local screens next month, its distributor said Friday. "Svaha," a Sanskrit term used in Buddhism meaning "amen," is the latest from director Jang Jae-hyun of the 2015 box office hit "The Priests" about Catholic exorcisms. 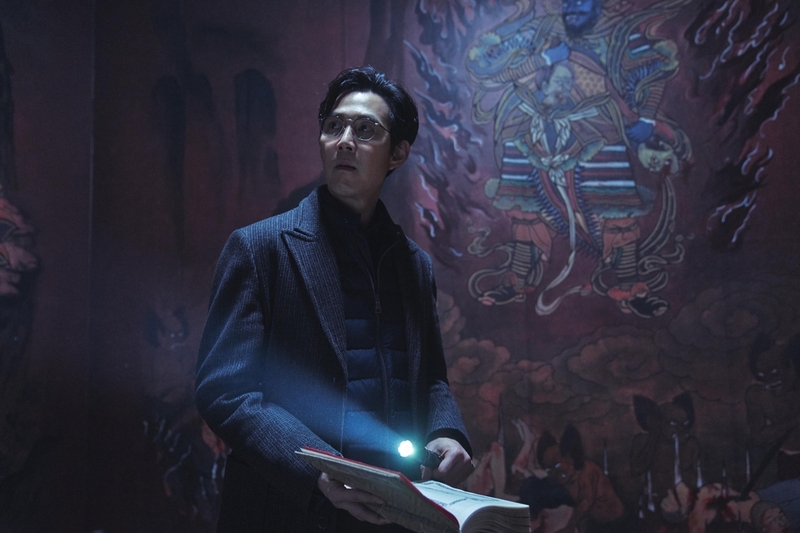 Also written by the director himself, the new Korean film depicts another religion, a secret hybrid religious cult heavily influenced by Buddhism, known as Deer Park. This teaser image for the film "Svaha," set for release on Feb. 20, 2019, shows Lee Jung-jae cast in the main role. A money-hungry Christian minister surnamed Park, played by Lee Jung-jae, goes on a private mission to expose religious corruption and comes across the clandestine religious cult based on a very fringe corner of a remote village. He finds himself seriously immersed in the investigation as a mysterious murder case involving disfigured twin sisters was connected with the cult. "It's a story knitted with elements of humans and gods," director Jang said in a press conference for the forthcoming movie. "As with 'The Priests,' this movie has a lot to do with shamanism. As I prepared (the previous movie), I got in contact with Buddhist materials that seemed to me an inexhaustible world, and I was immediately hooked," he said. "So I naturally crossed into the Buddhist view of the world." "Since I love a movie that continuously arouses viewers' curiosity, my goal also was to produce a film that keeps people curious," the director said, adding that every stage of his new film is laid with tension and suspension. It is the actor Lee's first film set against a contemporary background in about two years, during which time he took up roles as period characters, most notably the king of the underworld in the "Along With the Gods" film series. "I don't even remember exactly when I played my last contemporary character," Lee said. "The contemporary costume was a lot more comfortable (than those worn in period films)." "But it was really cold in Gangwon Province where the majority of the film was shot in the depth of winter," he noted. Two rising cinema figures -- Park Jung-min and Jin Seon-kyu -- joined the film in the respective roles of a mysterious cult member and a secular-minded Buddhist monk who, with his deep knowledge of Buddhism doctrines, helps the minister tackle the secret of the cult. "As I shot the film, I had the thinking that this movie may make its viewers look back on their view of the world and their value system," actor Jin said. "Every one (of the movie's viewers) might come down with that feeling at least once during the film." The 15-year-old new face Lee Jae-in plays the only major female role of the younger twin sister, and she is likely to become a solid cinematic presence with this film, as did Park So-dam with "The Priests." "I desperately clung to the movie even without a day's rest for the past three or four years. Now I am so nervous ahead of its release," the director said. Distributed by CJ Entertainment, "Svaha" will hit local screens on Feb. 20.